So I have 2 routers, a switch, a few PCs and an old PC to become a home server. Right now, I have 1 of the routers connected to the switch which wires every computers. It's working fine. I had it working once, but the network was really slow so I restarted everything and then every ping gave critical errors. 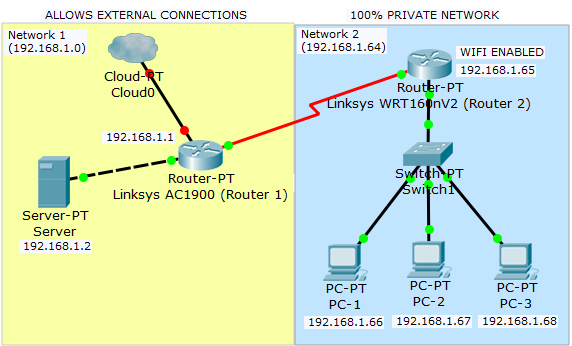 I was unable to connect to any router so I worked my way back to a stable single router network. I had also set static routes so that the PCs from the local network could ping the server and vice-versa. Replace either router with a switch, or disable routing on one, or simply eliminate one and put everything on one network with one DHCP server. Not the answer you're looking for? Browse other questions tagged router home-networking dhcp nat home-server or ask your own question. Why can't my Windows Home Server see the internet? Home network setup - must everything be on the same subnet?